Follow this link to view an NBC News report from April 2012. J. David Hacker is associate professor of history at Binghamton University, SUNY. His research focuses on the demographic history of the United States before 1940. He has published articles on trends and determinants in mortality, economic and anthropometric correlates of first marriage, the onset of long-term fertility decline, the impact of parental religiosity on fertility, and the effect of the Civil War on southern marriage patterns. Scott King-Owen recently graduated from The Ohio State University with a Ph.D. in early American history. He completed a dissertation on law and state formation in post-Revolutionary North Carolina under the direction of John Brooke. James W. Loewen and Edward H. Sebesta, The Confederate and Neo-Confederate Reader: The “Great Truth” about the “Lost Cause.” Reviewed by David Goldfield. James Lander, Lincoln and Darwin: Shared Visions of Race, Science, and Religion. Reviewed by Jean H. Baker. Phillip W. Magness and Sebastian N. Page, Colonization after Emancipation: Lincoln and the Movement for Black Resettlement. Reviewed by K. Stephen Prince. Richard W. Etulain, Ed., Lincoln Looks West: From the Mississippi to the Pacific. Reviewed by Kristen K. Epps. A. E. Elmore, Lincoln’s Gettysburg Address: Echoes of the Bible and Book of Common Prayer. Reviewed by Patricia Ann Owens. Gale L. Kenny, Contentious Liberties: American Abolitionists in Post-Emancipation Jamaica, 1834–1866. Reviewed by Rebecca Hartkopf Schloss. Peter Wood, Near Andersonville: Winslow Homer’s Civil War. Reviewed by Kirk Savage . Steven E. Woodworth, Ed., The Chickamauga Campaign. Reviewed by Christopher Stacey. Johnnie Perry Pearson, Ed., Lee and Jackson’s Bloody Twelfth: The Letters of Irby Goodwin Scott, First Lieutenant, Company G, Putnam Light Infantry, Twelfth Georgia Volunteer Infantry. Reviewed by Steven E. Sodergren. William A. McClendon, Recollections of War Times By an Old Veteran while under Stonewall Jackson and Lieutenant General James Longstreet: How I Got In and How I Got Out. Reviewed by Jeremy Prichard. Bobbie Swearingen Smith, Ed., A Palmetto Boy: Civil War‑Era Diaries and Letters of James Adams Tillman. Reviewed by Audrey M. Uffner. Marilyn S. Blackwell and Kristen T. Oertel, Frontier Feminist: Clarina Nichols and the Politics of Motherhood. Reviewed by Stacey Robertson. Jeff Forret, Race Relations at the Margins: Slaves and Poor Whites in the Antebellum Southern Countryside. Justin A. Nystrom, New Orleans after the Civil War: Race, Politics, and a New Birth of Freedom. Ami Pflugrad-Jackisch, Brothers of a Vow: Secret Fraternal Orders and the Transformation of White Male Culture in Antebellum Virginia. Robert N. Rosen and Richard W. Hatcher III, The First Shot. 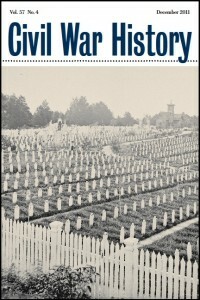 Jonathan D. Sarna and Adam Mendelsohn, Eds., Jews and the Civil War: A Reader. Jyotirmaya Tripathy, Sura P. Rath, and William D. Pederson, Eds., Abraham Lincoln without Borders: Lincoln’s Legacy outside the United States. Spencer C. Tucker, Ed., The Civil War Naval Encyclopedia. 2 volumes. Hans Konrad Van Tilburg, A Civil War Gunboat in Pacific Waters: Life on Board the USS Saginaw.